The packaging of liquids is somewhat complex compared to other types of packaging due to their state and nature. Liquid packaging requires exceptional sealing strength and gas barrier properties. From small sachets to tetra packs, liquids come in a wide range of packaging. A large number of liquid products such as Ketchups, Mayo, Olives, Sauces, Olive oil, and chocolate syrup etc. require high quality flexible packaging. The key packaging requirements for liquids include barrier, hot fill, package toughness, flex crack resistance, and seal integrity. Ester R&D’s continuous efforts and extensive knowledge of resins have enabled us to place several innovative solutions in the liquid packaging category. Ester offers “flexible packaging” as well as “rigid packaging” options. Under flexible packaging solutions, it offers a range of metalized and non metalized films apt for liquid packaging; while for rigid packaging it offers PET resin for Packaging applications (Hot fill and Barrier). The metallised ultra-high barrier film, Type EB104 offers very high barrier performance and good metal adhesion. It is a flexible and consumer-friendly packaging solution that has replaced the traditional aluminum foil in the laminate as a sandwich barrier layer for various liquid packaging applications. 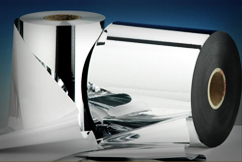 The metallised ultra-high barrier film Type EB103 is a breakthrough product which offers high barrier coupled with very high metal adhesion, especially in a solvent-less lamination process. These specialty films are suitable for hot fill, ketchup, wine packaging, etc. In addition to the superior quality and strength, our films allows significantly higher filling speeds over sustained periods of time.